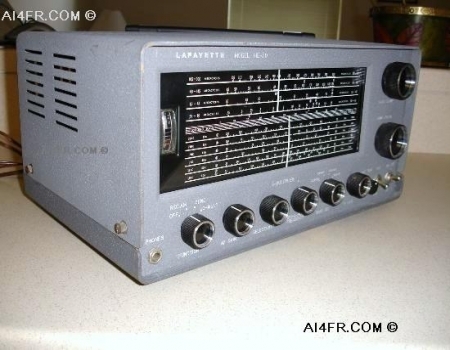 The Lafayette HE-30 is a general coverage Single Conversion Super heterodyne receiver. 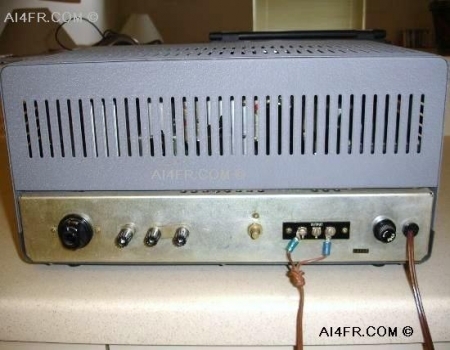 This HE-30 has 9 tubes and 4 bands covering .55-1.6, 1.6-4.8, 4.8-14.5 and 10.5-30 MHz. The radio has a Bandspread that covers the 80 through 10 meter amateur bands. The receiving modes are AM,SSB and CW with a selectivity of ± 2.6 kHz. 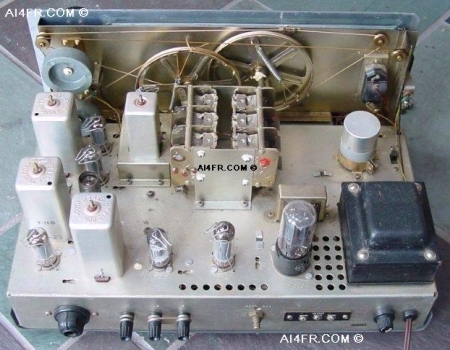 The 9 tube complement and their functions are as follows, a 6BA6 as an RF Amplifier, 6BE6 as the Mixer, 6BE6 as a Local Oscillator, 6AV6 as a Q Multiplier and BFO, 6BA6 as the First IF Amplifier, 6BA6 as the Second IF Amplifier, 6AV6 as a Detector,ANL and the First Audio Amplifier, 6AQ5 as the Audio Output, 5Y3 as the Rectifier. This receiver has one RF and two IF stages. Besides the above, the other features include a ¼" Headphone Jack, an S-Meter a Beat Frequency Oscillator(BFO) a Q-Multiplier an IF Gain, ANL switch, Antenna Trimmer, Dial Lamp, Standby and a AVC switch. The power supply is 110 to 220 volts AC at 50/60 Hz. This receiver requires an external speaker or headphones for use. The matching speaker is the HE-48A. 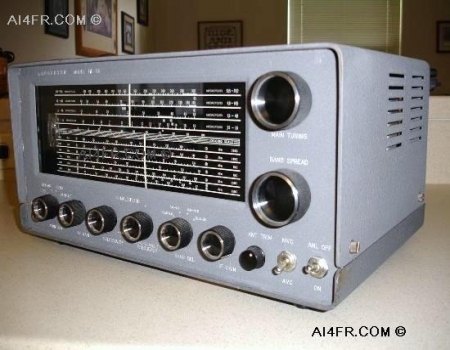 The model KT-340 is the same radio but was offered in a kit form at a price of $75. These next two photographs show the Lafayette HE-30 from a couple of different angles. 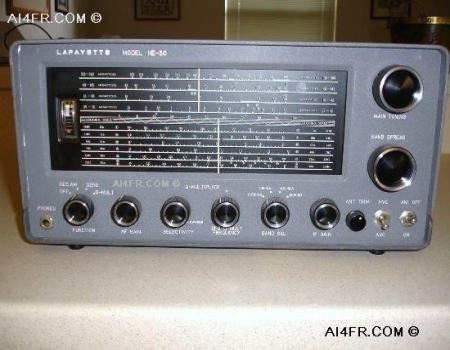 This is one of them rare radios that required nothing more then a slight cleaning when I received it. The former owner, an amateur radio operator took great care of this item. The photograph above shows the HE-30 with the case removed. This radio has no hinged cover so the only access to the tubes is to remove the case. 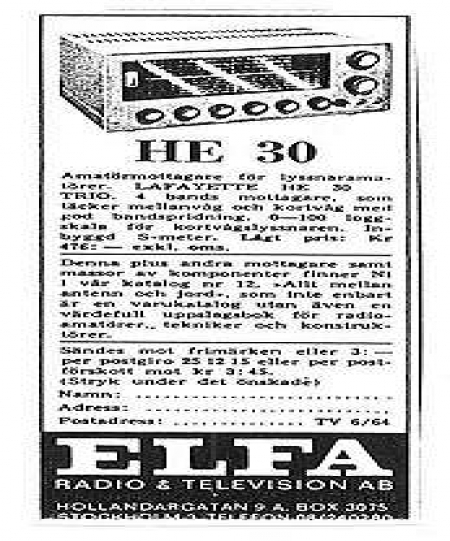 The picture on the right is an ad for the HE-30. While the letters to this ad are a touch blurry, the words are in the Swedish language so reading it may be a tad difficult unless one is fluent in that language.